WILLEMSTAD - There are problems with school buses again. On the route Hato to Punda the bus is so full, that children often see it pass by and have to wait for the next bus. 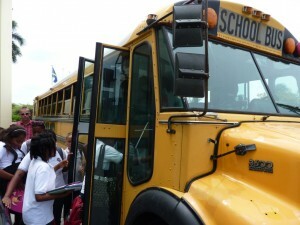 A next bus often does not arrive, so the children arrive late at school. The same thing happens on the way home in the afternoon. The parents call on bus company ABC to keep itself to the schedule and actually use the promised extra buses.